Join a comical cast of backyard pets - Captain Hooktail, First Mate Chubs, Helmsman Patch and Tinkles - as they hunt for treasure (at the local butcher shop) and fight with sworn enemies (alley cats!) in this fully illustrated middle grade graphic novel for kids who like silly books. 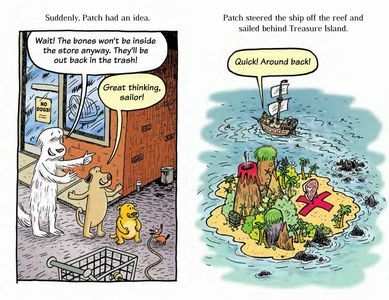 Scurvy Dogs is a laugh-out-loud companion to any story time circle. 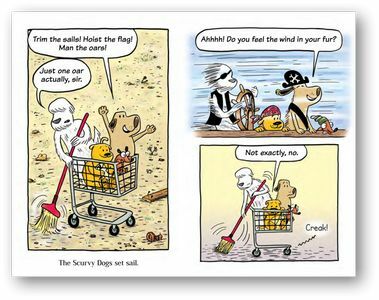 Get ready to hoist the flag, trim the sails, man the oars... and laugh as a group of backyard dogs go on a hilarious, swashbuckling pirate journey. The graphic novel format introduces visual storytelling alongside humorous dialog and plot. Kevin Frank is an internationally-syndicated cartoonist and illustrator. This multiple award-winning artist, who has been profiled in the New York Times, steals his best material from his wife and three children. My 10 year old son read this book and loved it. He read it all in one sitting. I would especially recommend this book to reluctant readers as it a fun graphic novel with cute pictures. We just got this book and my 3 year old was entranced while I read it. It is a fun chapter book that is in a comic style. 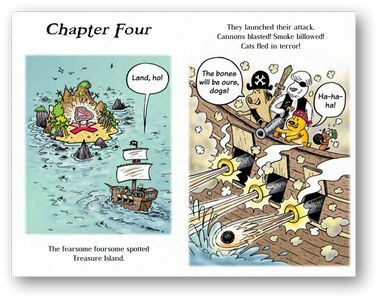 It is about 4 dogs who are friends who pretend they are pirates and go on an adventure in search for treasure (yummy bones). Super fun book, I totally recommend it!